Spider-Man takes delivery of Aunt May’s hat. “Five minutes later” he is out looking for criminals. After stopping the burglary, he heads to the Bugle to see Betty. 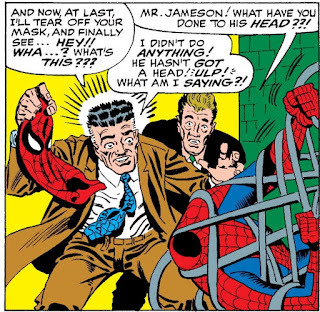 “The very next day” Jameson sends reporters out to collect anti-Spider-Man stories. “Meanwhile” the first interview hits the streets; Rinehart goes to the Bugle offices and Jameson tells him to come back “tonight at 8”. Stan’s “meanwhile” is a huge problem. In panel 1 of page 6, we see a reporter asking a crowd for quotes; on panel 3 we see Flash Thompson berating the same photographer. The natural implication is that panel 3 follows on directly from panel 1. But Stan clearly says that while Liz, Flash and Peter are having their chat, the interview is published, and an interview obviously can’t go from tape to news-stand in a few seconds. So we have to assume that J.J.J. conducts several sets of vox pops over several days, and that Flash’s encounter with the reporter happens a day after the reporters conversation with the lady who “never said she did” hate Spider-Man. I don’t think either Lee or Ditko have noticed this problem. Narratively Flash’s “I wanna talk to that crumb...” follows on from “...but I never said I do hate Spider-Man”. But realistically hours or days must have passed. Panel 3 “The next day” Peter Parker reads the first interview with Rinehart. Peter rushes out of the house “to find that Doc”. Flash Thompson is waiting outside his house. Somewhere near the Bugle offices, he encounters the first hallucinations. Decides the “can’t go to Jameson now” and swings all the way home again! Realises how sick he is, rushes out of the house and heads to Rineharts house. His address was in the paper all along! Panel 7 on page 9 is a huge problem. 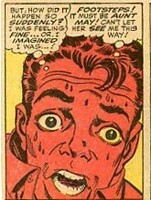 In between Peter Parker distracting Flash and Spider-Man seeing the hallucinations, there is a single picture of Betty speaking on the phone – telling J.J.J that Rinehart wants to arrange another interview. (Why?) 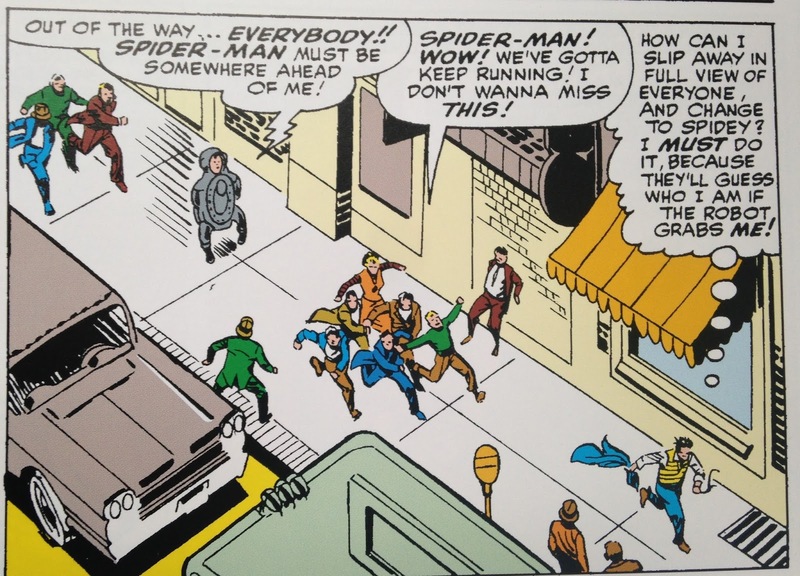 Stan takes this to mean that pages 9-12 takes place somewhere near the Bugle offices, which creates the silly situation that Spider-Man swings all the way to Manhattan to find out where Rinehart lives, swings all the way back to Forest Hills because he isn’t feeling well, and then remembers that he knew the address all along. I submit that the whole thing would make much more sense if Betty were simply taking a call from her boyfriend “Yes, Peter, Dr Rinehart is staying at 221b Queen Boulevard, quite near your Aunt’s house”, and the whole of pages 9-24 take place on Peter’s home turf. It makes more sense for Rinehart to have his spy-cats and his hologram projectors set up near his base than for them to be randomly on a rooftop by the Daily Bugle. In the first Spider-Man Annual, Stan Lee states that Spider-Man can swing from Forest Hills to Manhattan in 3 minutes – about 200 miles per hour. Over the years, Spider-Man has been shown catching up with moving cars and even trains, so speed of 50 mile per hour seems a lot more believable. This would been that he could commute from home to the Bugle in about 15 minutes – a lot quicker than the subway! ?6PM Betty wonders how much overtime she will have to put in “tonight” – so it must already be passed her normal working hours – say 6 pm? Foswell and Jameson leave, leaving Betty alone in the office. ?6.30 Foswell and Jameson get a taxi to Rinehart’s; Flash Thompson happens to be there. Rinehart’s offices must be in Forest Hills, somewhere near Peter and Flash’s school, which is maybe a 30 minute cab ride from the Bugle. Again: it seems clear that Peter Parker leaves the house as soon as he reads the morning paper and, realizes Flash is tailing him pretty much as soon as he walks through the door, then Flash must have been aimlessly walking the streets for seven or eight hours. ?7.30 It's hard to see how Spider-Man can have spent more than an hour in Rinehart's offices. After the big denouement, Peter bumps into Liz and Connie, and agrees to give Liz a jolly good science lesson. Even though it can’t be earlier than 8pm, Aunt May says she will wait up for him. "More X than you can shake a stick at” is a pretty common expression; possibly derived from shepherds pointing staffs at their sheep. 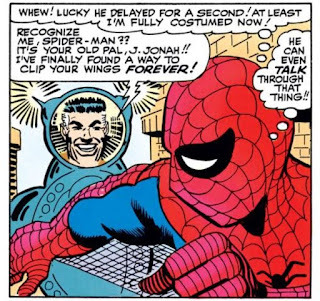 “Shake a web” doesn’t mean very much, but Stan thinks it is real funny to substitute a “Marvel” word for an ordinary one in a well-known expression. (On the letters page, he claims that Amazing Spider-Man #25 has "more subplots than you can shake a Daily Bugle at"). 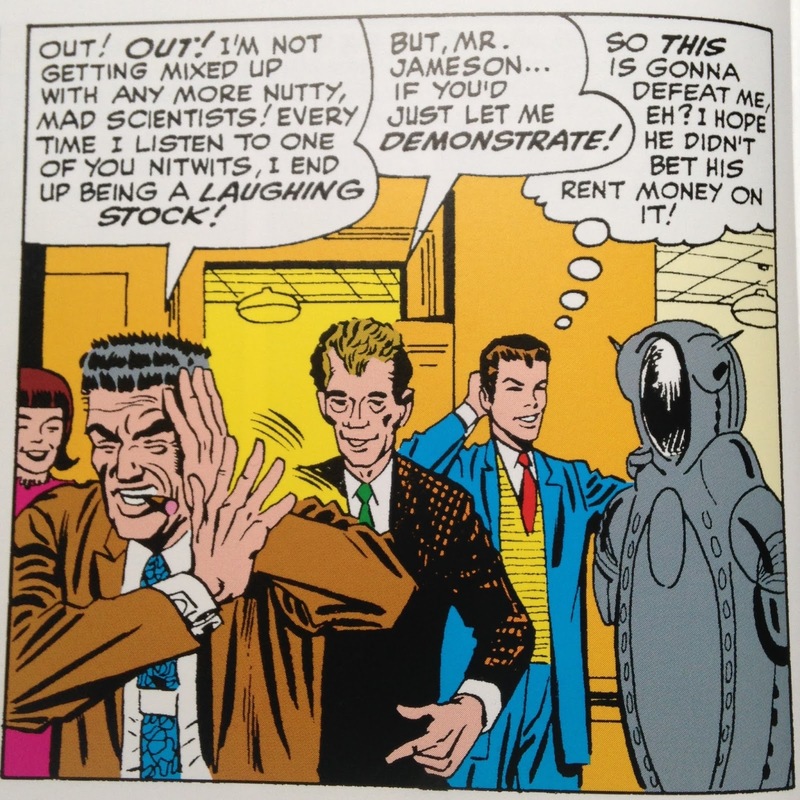 In addition to Dr Rinehart, Spider-Man encounters hallucinations of Doctor Octopus, the Vulture and the Sandman, suggesting that the maximum number of villains you can shake a web at is three. “Cash on delivery” was a system where customers could order items from a mail order catalogue and pay the delivery man when the goods arrived. It was popular with customers because it meant they could keep their money in a cookie jar rather than opening a cheque account; and with vendors, because it tended to encourage impulse purchases. A nice pillbox hat was being advertised in 1965 for $3.98, so $6.95 — about $50 in today's money — is a considerable extravagance. The last time we saw Peter selling any pictures was two months ago (issue #22), so either Marvel Time is running quite a bit slower than Real Time, or he has been having undocumented “off stage” adventures between issues. p2 "I'm gonna find some hot news scoop to photograph just like a friendly neighborhood Spider-Man should"
Peter Parker's motivation for being a superhero is still at least partly mercenary. He's spent several weeks or months allowing burglars to kill uncles without let or hindrance, because he’s been revising for his exams. (He’s going to graduate in two issues time.) What gets him off his webbed backside and onto the streets isn’t a sense of responsibility, but the need to pay for Aunt Mays extravagant tastes in millinery. This is just what Lois Lane says about Perry White in That Other Comic. Another move re-positioning J.J.J. as a comic foil who shouts a lot but doesn’t really mean it? Make it more hokey; presumably by adding hokum, a mixture of hocus-pocus and bunkum. “Sob sisters” - Although still mainly a male profession, newspapers employed female staff to write “will no-one think of the children” human interest stories”. “Schmaltz” - Excessive sentimentality (a specialized kind of hokum). Originally Yiddish for “goose fat”. p7: "It is only a matter of time before his id and his ego get so confused that he forgets who he really is ...and then he will suffer a severe nervous breakdown!" As ever "psychiatrist" is taken to be synonymous with "psychoanalyst". A nervous breakdown is a temporary bout of very severe depression, and probably not the kind of thing a Freudian would treat. "Going mad" is something quite different, implying some kind of violent insanity that would require hospitalization. The lettering in this text is slightly different from the rest of the panel (note the wider than usual margin). Perhaps Stan only noticed that Spidey had left his Spider-signal behind at the last moment and asked the letterer to hurriedly add an additional balloon? But Ditko was already on top of the problem: Spider-Man doesn't use the beam again this issue, and #25 begins with him retrieving it. p13: "Luckily, this newspaper mentioned Rinehart's home address in its article". Rinehart had told Jameson that he was visiting New York "on vacation from Europe", so it's odd that he has a home address, complete with consulting room, in Queens. Perhaps this is what tips Foswell off that he's a fraud? Door entry intercoms were not that much of an innovation in 1964, particularly in apartment blocks, although they might have been a bit pretentious in a private house. 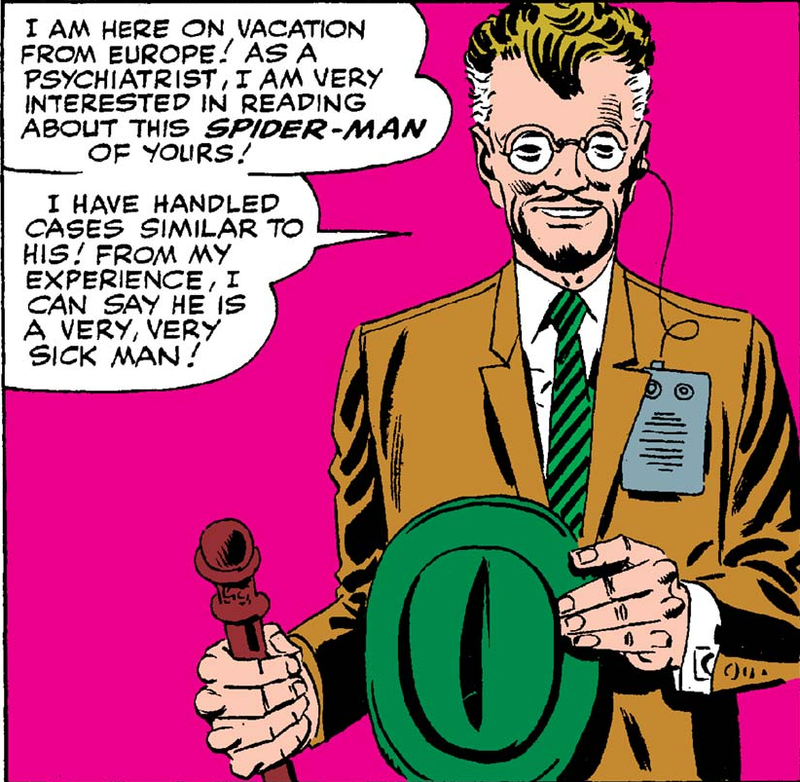 Spider-Man did in fact visit a psychiatrist in issue #13, but left without treatment for precisely this reason. P17 “It won’t do me any good being Spider-Man if I lose my mind in the process”. Note that he doesn’t say “It won’t do any good…” or “I won’t do any good…”: he says “It won’t do ME any good.” Under the circumstances I think we can call this a Freudian slip. Mysterio first appeared eleven months ago, in Amazing Spider-Man #13. When we last saw him, in the summer of 1964 he was sharing a cell with Doctor Octopus. In Amazing Spider-Man #196, Peter Parker will receive a telegram from Restwell Nursing Home informing him that Aunt May has died. However, in issue #200, he will discover that she is alive and well. Well, as well as she ever is. The report of her death is a ruse by the guy who ran the old folks' home: one Dr Ludwig Rinehart. I didn't spot it. 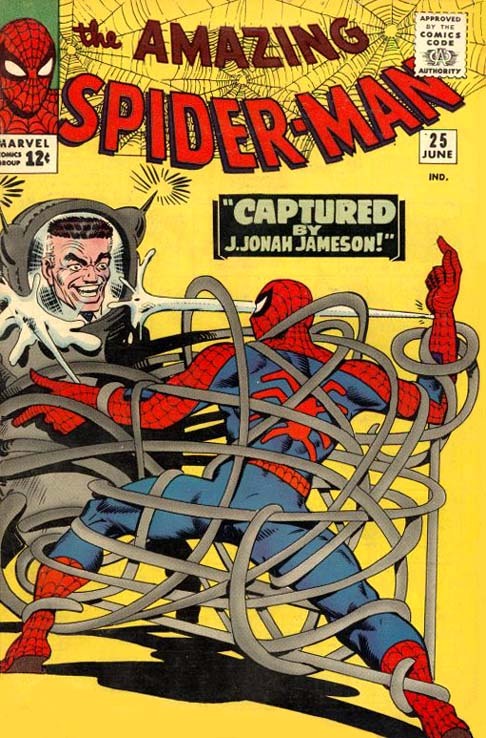 Parker has made at least two recent sales to Jameson — some “wizard” pictures in #22 and some “sensational” ones in #19, so why is there less than $10 in the cookie jar? Six months ago, Stan Lee was getting very excited because he’d published a comic (Amazing Spider-Man #18) in which the hero didn't have a fight with a villain. The present issue is similarly conflict- free: Spider-Man lashes out at hallucinatory projections of Doctor Octopus, Sandman and the Vulture, but it’s otherwise a purely psychological tale. Spider-Man has an oddly passive role: falling hook, line and sinker for the villain’s ploy, and only being saved from disaster by dumb luck and coincidence. The Bugle publishes an interview with a psychiatrist, one Ludwig Rinehart, who thinks that Spider-Man is about to go mad. Peter Parker reads the interview and immediately starts to doubt his own sanity. He sees hallucinations of his old foes, and imagines that ordinary rooms have turned upside down. So he goes to Rinehart’s surgery, and lets him put him on the couch. But at the very last moment — when Spider-Man is on the point of revealing his secret identity — Rinehart is revealed to be a fraud. He’s none other than Mysterio “the master of mystic effects and startling illusions.” The hallucinations were 3D projections and the upside down rooms were stage sets. This is not the first time that Spider-Man has visited a psychiatrist. He sought medical help in issue #13 when he believed he was becoming schizophrenic. The un-named shrink in that story felt that “if I can make a patient out of him, I’ll make medical history”; the fake one in this story says “a case like yours will make medical history”. 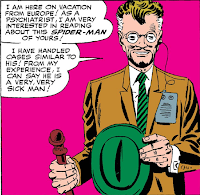 Spider-Man had second thoughts about being treated by the real psychiatrist because he realized that if he spoke freely he would give his identity away; he is on the point of revealing his identity to the fake psychiatrist when the ruse is revealed. Of course Spider-Man wasn’t really suffering from schizophrenia in issue #13, any more than he is really having a nervous breakdown this time around. He believed he was committing crimes in his sleep, but they were actually being committed by a fake Spider-Man. The fake Spider-Man was, of course, Mysterio. Two stories where Spider-Man doubts his sanity; two psychiatrists; two sets of illusions done by Mysterio. 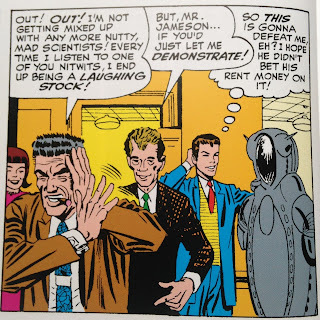 Did Lee and Ditko think of Mysterio as “that villain who sends people mad” (in the way that Doctor Octopus was fast becoming “that villain who kidnaps aunts”)? Did they look back on the “psychiatrist” episode in issue #13 and think “we could have done more with that, let’s revisit it”? Or had Ditko always intended the Menace of Mysterio to have been mostly about a villain gaslighting Spider-Man, and been forced by Lee to put in a big fight scene? 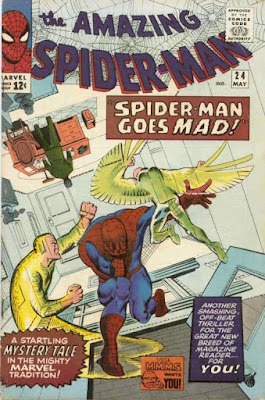 Is Spider-Man Goes Mad essentially just The Menace of Mysterio rewritten according to Ditko’s original intentions? This is one of those comics which I have a vivid memory of reading when I was a child. I recall reading out the title to my Mother, and her replying “Well, don’t you go mad!”. I must have read it may times, because my copy (of the British Spider-Man Comics Weekly) is on the point of disintegration. I remember being very proud that I had noticed the cat on page 10 and the bat on page 11, which are of course Clues: they turn out to be robots that Rinehart was using to spy on Spider-Man. I remember being delighted when Rinehart was unmasked. Mysterio was the villain in the first comic that I ever read, and therefore one of my favourites. Even at the age of 8, I think I felt that Mysterio’s appearance in the Sinister Six had been a little underwhelming. This time, we got to Mysterio really being Mysterio, albeit without his silly costume. I still think the story holds up very well. Page 12 is one of Ditko’s very finest: the fatigued Spider-Man, leaning against a wall, with his head in his hands; Parker looking at himself in the mirror; the splendid horror-comic panel as he realizes that he really is losing his mind. The denouement is also one of the best. Spider-Man is on Dr Rinehart’s couch. Rinehart assures him that the only way to avoid going completely mad is to make his secret identity public and give up being Spider-Man altogether “I…I guess you’re right.” replies our hero, who was feeling perfectly fine when he got up this morning. The sequence calls to mind both The End of Spider-Man and Spider-Man - Public Menace in the very first issue. We’ve watched all hope being stripped away from our hero, and he is at his lowest ebb. It would be nice to say “and, at this low-point, we discover how truly heroic he is” but in fact, he is entirely prepared to throw in the towel. He may have promised in issue #18 to stop whingeing, but there is no shortage of self-doubt for Mysterio to exploit. It's at precisely that moment — just when he’s about to unmask — that J. Jonah Jameson bursts in (with Flash Thompson tagging along behind) — to reveal that Rinehart is an impostor. Jameson has inadvertently rescued Spider-Man’s career. Gosh! How ironic! This is all splendid: the key scene in which Thompson tries to rugby tackle Jameson, blocking Spider-Man’s path to Rinehart is embellished by a perfectly judged Stan Lee caption: “Just when it seems that things can’t get any more confusing…” The sudden shift from angsty melodrama to farce has a fairy tale quality to it -- what Mr Tolkien would have called a eucatastrophe. 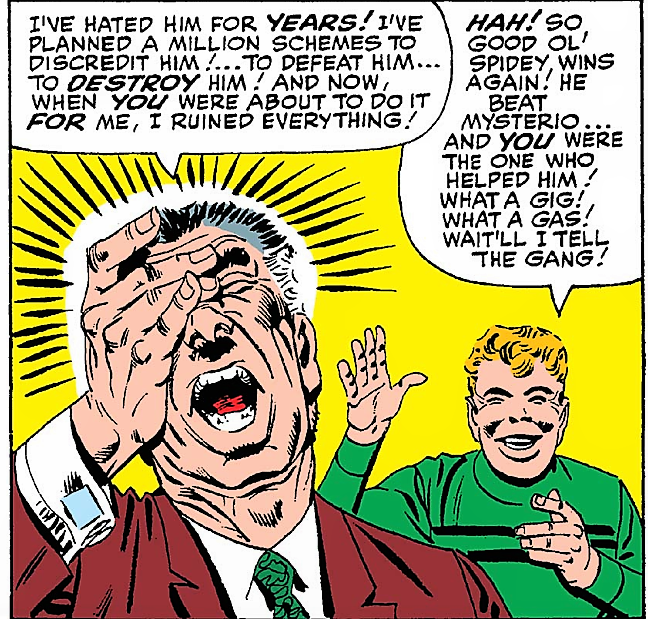 The completely demoralized Jameson sharing a frame with the ecstatic Flash Thompson (”I actually saw my idol in action! He even spoke to me! Even if he did call me a fool! He spoke to me!”) is icing on the cake. But the more I think about this story, the more problems I find with it. As is usually the case with Ditko-led episodes, the main “madness of Spider-Man” plot is accompanied by two or three major subplots. The first of these involves J. Jonah Jameson launching a new campaign against Spider-Man. Instead of telling everyone what he thinks about our hero, he is going to print a series of vox-pops asking members of the public what they think. I don’t know whether Stan or Steve had been to see The Front Page that month, but this is one of very few occasions when the Daily Bugle actually feels like a newspaper — Jameson shouting for the copy boy; bringing in subs ("so sisters) to rewrite Foswell’s crime report ("We can say Spider-Man was brutal to those misguided crooks”). It’s a wonderfully cynical couple of panels. The press, the public and the publisher get equally trounced. A nice lady says “But I never said I do hate Spider-Man” and the reporter replies “Do you want your name and picture in the paper or don’t you?"? 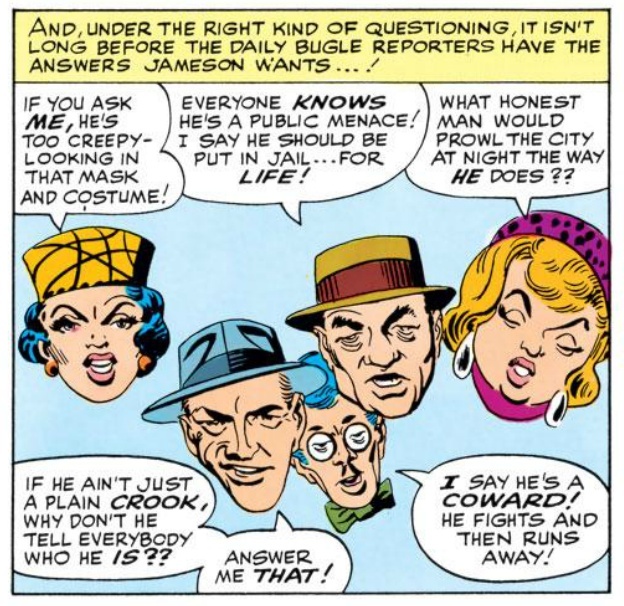 Stan’s wryly comment that “under the right kind of questioning it isn’t long before the Daily Bugle reporters have the answers that Jameson wants…”. And Jameson is at his hypocritical best “All I’m doing is publishing the results of an absolutely impartial, unbiased newspaper survey.” I truly think it was this comic that first taught me to be skeptical about the press. But none of this has any particular point of intersection with anything else in the story. 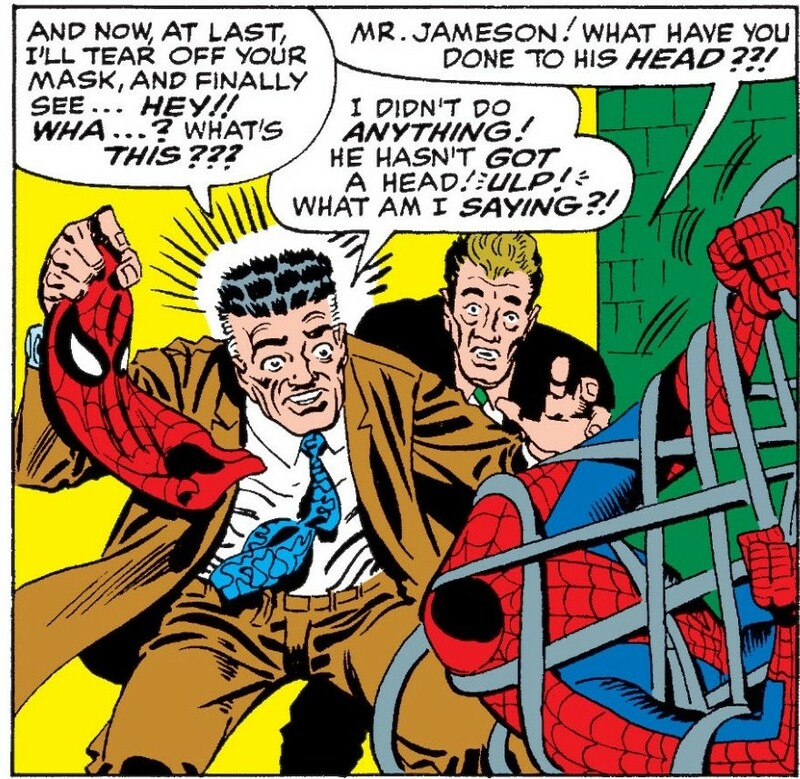 Jameson is prepared to talk to Rinehart because he’s in a good mood after the success of the interviews; but when wouldn’t he have talked to someone with a scheme to discredit Spidey? Mysterio has been planning to drive Spider-Man mad for years and says that the interviews tell him that the right moment has come. But how many moments have there been when Jameson wasn’t publishing nasty stories about Spider-Man? 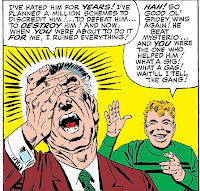 Flash Thompson is cross with Jameson because his reporters are collecting anti-Spider-Man quotes near his school; but surely he’s known for years that Jameson hates his idol? The second sub-plot is about Peter, Flash and Liz. Liz Allan asks Peter to help her with her science homework. 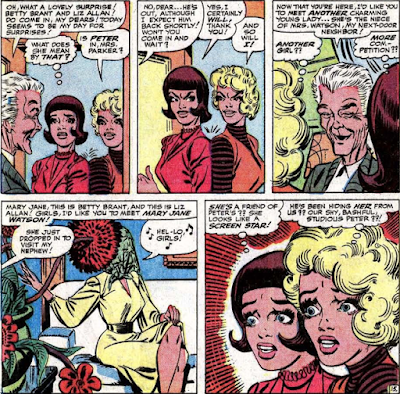 Neither of them make the slightest effort to pretend that this is anything other than a date: Liz does her tie-straightening and “Petey, dear” routine and thinks that Peter is “so much more interesting then that empty headed Flash.” The final frame is literally them walking off into the sunset hand in hand. Peter is more than usually dickish about it. He’s cross with Betty because he found another letter to Ned Leeds under her desk, and sees going out with Liz as a way of punishing her. (“If she’s going to write to Ned Leeds behind my back, I’ll show her!”) Honestly, it’s a complete enigma why Peter and Betty’s relationship never got off the ground! When Flash sees Peter and Liz together, he’s furious, and starts following Peter around. But again: has there been an episode when Flash wasn’t mad at Peter? The crunch comes on page 16. In panel 2, Foswell rushes in and tells Jameson that he’s discovered that Rinehart isn’t really a doctor at all. This comes from nowhere — it’s a pure deus ex machina. Five panels later, Jameson leaps out of a taxi outside Rinehart’s home….and Flash Thompson just happens to be passing and follows him in. Stan Lee clearly thinks that this is a bit of a stretch, and makes his usual excuse “As so often happens in life, the long arm of coincidence reaches out…” So the Peter/Liz subplot has also taken us precisely nowhere. Flash might have been walking past Rinehart’s home (which seems to be in Forest Hills,) whether he had been mad at Peter or not. For a comic — or tragic — denouement to work, we have to feel that it is inevitable — a group of characters, all acting logically and in character, come together in a ridiculous or disastrous way. If we feel that The Author has arbitrarily forced them together, the amusement or horror is greatly reduced. 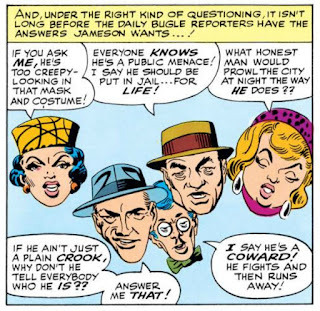 I think we can just about buy Foswell finding out that Rinehart is phony – he is a reporter, after all, and Mysterio hasn’t been doing a very good job of covering his tracks. But Flash Thompson just happening to be there at the opportune moment is a step too far. "Well, then, Andrew. If you basically love this story, but find that it breaks down when you start to think about it, then obviously you are thinking about it too much. Remember the old joke? 'Doctor, doctor, it hurts when I do that.' 'Well, don't to that then.'" There is something to this. The breakneck pace of the story, and the sheer number of incidents squashed into a few pages, means that the reader isn’t paying that much attention to the exact chronology or chain of events. As we race through the comic, we get a general sense that Peter and Flash and Jonah are all running around and all end up in the same place at the same time. Flash is chasing Peter, or possibly Jameson; Jameson is chasing Rinehart; and Spider-Man swings all the way from Forest Hills to Madison Avenue and back again to find out where Rinehart’s lives even though he already has his address. It’s a mistake to over-think it. And one of the people who over-thought was none other than Stan Lee. I think there were some genuine issues with the chronology and continuity of the comic which Ditko presented him with. I think he made a valiant effort to make sense of it; but in doing so, I think he created a new set of problems which weren't there before. On page 7, Ditko drew Flash with clenched fists, watching Peter Parker walk away from him. On page 8, he drew Flash again, still with his fist clenched, ducking behind a tree as Peter Parker purposefully headed off somewhere. The clear meaning is: “Flash has followed Peter home from school.” On page 9, Flash’s head sticks out from behind a corner, before Peter gives him the slip. The message is "Flash is still following Peter." A few pages later, Flash is still pounding the pavement, when Jameson turns up. Again, it is clear that only a few minutes have passed and he is still trying to figure out where Peter went. Flash’s strand in the story takes only a few minutes: however long it takes to walk from the school to Aunt May’s house and from there to Rinehart’s surgery. Lee identifies an obvious problem: clearly, Jameson can’t have commissioned and published a vox-pop, conducted an interview with Rinehart, published it, and discovered he’s been fooled, all in the time it takes Peter Parker to walk home from school. So he adds some captions, making it clear that Liz asking Peter for a date and Flash following Peter home happened on different days; and establishing that Spider-Man’s encounter with the ghost villains took place in Manhattan, near the Bugle offices, rather than in Forest Hills, even though nothing in the artwork requires this. In one sense, Stan Lee is right: some time has to elapse for the story to make sense. But in another, more important sense, Steve Ditko is right: a comic book story should unfold in comic book time. The amount of time it takes for something to happen is the amount of time it takes for the reader to read it. You can publish a newspaper in one panel; crossing town might take you six. And if the captions are flashy enough and the denouement is funny enough, it really shouldn’t matter. Pay no attention to the man behind the curtain. It’s not only Mysterio who deals in illusion.